One of my favourite places to stop by while in the Hunter Valley is the Hunter Beer Company located at The Potters Hotel & Brewery in Nulkaba. The service there is impeccable combine with beers brewed on-site that are cold and tasty the only downside to a visit is the argument that pops up without fail around the 1 1/2 beer mark, about who is going to be the responsible one that switches to soft drink to drive everyone else home. Last time I stopped by I decided to pick up a bottle of their Bock for future enjoyment without worrying about staying under the limit and I must say it did not disappoint later when it was taken out of the fridge. Into a glass the Bock poured a very dark brown colour with a small creamy tightly packed white head that didn’t hang around long before subsiding to a thin lace covering. On the nose slightly sweet malt notes accompanied by aniseed, coffee and cocoa aromas. Taste wise this brew has a very nice flavour profile consisting of cocoa, coffee, bread, toasted grain notes, the mouth feel is somewhat creamy and the ending smooth with the gentle flavour of lightly burnt toast. Verdict: Very nice come spring or autumn I would love to sit outside and enjoy one of these only downside is the drive to go get them. I am not the biggest fan of hoppy IPA’s etc but I still like a beer with assertive hop flavours that jump out at you. The Boat Rocker Alpha Queen seems to fit this category perfectly, brewed in Melbourne, they add loads of Cascade hops late in the kettle and then dry hop loads more afterwards, giving intense flavour without the intense bitterness. Decanting into a glass the Alpha Queen is clear amber colour with an off white head that stands around 1cm tall. The smell is bountiful with intense pine, toffee and grapefruit aromas predominating. On the palate the hops start mild tricking the drinker into thinking that is all there is, but around the halfway mark they kick in with a no holds barred attack before subsiding to a assertive yet mildly bitter after taste. Grass, spice and citrus ( mostly grapefruit ) are the main flavours noticed from the hops, with caramel and biscuit malt acting as a base to keep the bitterness in check. Verdict: Very refreshing, unbeatable on a hot summer day,leaves the drinker hanging for a second. Would be awesome to enjoy with a nice big steak or similar. 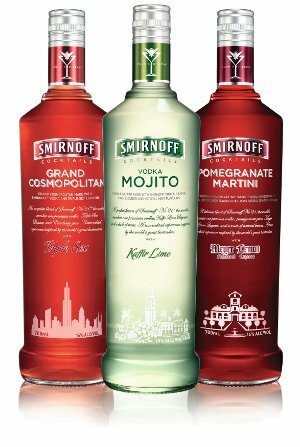 Smirnoff has recently released their ‘Perfect Pour’ range of premixed ready to drink cocktails. Perfect for parties, barbeques or just a quiet drink at home, you cant now enjoy your favourite cocktail concoction without the mess and the fuss of making from scratch. The range is currently comprised of three flavours including Pomegranate Martini, Mojito and the Grand Cosmopolitan.They come ready to pour into a chilled glass and are available in all major bottle shops around the country, costing around $23 for 700mL bottle.